Tottenham's first match of their American tour took place in the heat of the San Francisco afternoon and perhaps understandably, it was a half-paced game against a side who are already in the midst of their season. The Earthquakes looked sharper to the ball and more willing to put their foot in, but their finishing perhaps showed some of the drawbacks inherent in the MLS. Spurs put out a mix and match side with several youngsters among the established first teamers and Jermaine Jenas and Carlo Cudicini both returned to the team after long injury lay-offs. Having only had a couple of days to get used to the weather, which is a little cooler on the West Coast than the East, Spurs tried to hold onto possession more than try to carve out a large number of chances, but they could have gone a goal down inside three minutes, when former Spurs target and Reading winger Bobby Convey played the ball back to Chris Wondolowski, but the midfielder shot wide when in on goal. His finish was not composed and the ball was weakly dragged across the face of the goal. Without their World Cup players, Spurs were happy to try and get Andros Townsend away down the left and his runs gave the San Jose defenders a tough time, but his final ball was not always what was required. One run in the tenth minute won a corner and from it, the ball was played short by Bale to Jenas, whose shot across the area went into the heart of the box and Robbie Keane was on hand to knock the ball into the net at the far post, but the goal was ruled out for offside. As is usual, Keano disagreed with the linesman and wagged a finger at him. When Townsend was released into the left side of the box, his left footedness went against him and as he tried a shot, his right foot went from underneath him and he skewed the effort wide. In fact a number of players had difficulty keeping their feet and the watering of the hard surface may have made it a bit skiddy on top. At the other end, Cornell Glen was put in by Sam Cronin, but once more the lack of quality saw his shot go a long way wide. Townsend put one cross behind Keane, before picking him out with a pull back and the Irishman did not get hold of his shot properly and it went wide from inside the box. Halfway through the half, Carlo Cudicini was called into action for the first time, as he dived left to keep out a 30-yarder from Ramiro Corrales. But then Spurs put together a neat move down the right, with Hutton taking the ball on and playing it to Kyle Naughton to put in a low cross that Keane was not close enough to, as all that might have been needed was a touch to test the keeper. A 30 yard free-kick, placed centrally, saw Bale get his effort on target up near the top corner, but the keeper Busch was comfortable enough having moved his feet to get him into a good position to catch the ball. Glen showed good strength as he ran through against Alan Hutton, Kyle Walker and Younes Kaboul, but once more, a weak finish straight at Cudicini was the end result to his 33rd minute run. Straight away, the ball was thrown out and when it got to Jenas, his ball put Andros Townsend in and with the angle narrowing, he hit the side-netting, with players wanting a ball played into the middle of the box. Walker made a progressive run on the other flank and when he passed into the box, the ball was sliced out by a panic stricken Leitch. The last action of the first half involved Glen once more, but there was no power in his finish and the whistle blew on a goal-less first half. 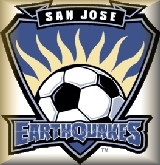 As is the custom in such games, the teams that took to the field for the second half bore little resemblance to those who played the first half, with the Earthquakes making more changes than Tottenham. One of the Spurs subs, Roman Pavyluchenko, was quickly into the action when he picked up the ball 25 yards out and attempted to lob the new SJ keeper Cannon, but the ball sailed a long way too high over the bar. The second half was less eventful than the first and really was just a training exercise, with Spurs getting some more cobwebs out of their system. Keane had a shot deflected wide, Bale went close with a curling effort and then planted a cross onto Keane's head, but his "head shot" went over the bar. The only unseemly incident in the game came when Jasseh went in late on Modric and was shown a yellow card, as it was about the fourth time he had run into someone after the ball had gone. All well and good when wearing big protective uniforms in their American version of football, but not the done thing in what they call soccer. Townsend was keen to get on the score-sheet, but his long distance drive lacked venom and as the late substitutions gave Spurs players a few minutes respite at the end of the match, the game fizzled out with the US side having the last two opportunities as Alvarez went through but then lacked the courage of his convictions, leaving the chance to evaporate into nothing and Jasseh showed good pace but once more, a hurried finish ended up in the side netting. A useful work-out for Tottenham and little more than that, but a good advert for the club in the Bay area of San Francisco and a chance for ex-pat Spurs fans and those on holiday to see the team play on US soil. The football played in the MLS is sub-League One stuff mostly and as such, it is disappointing that Spurs did not show enough to win the game, but with the home league already in full swing, perhaps the quality we had was nullified by their superior fitness. Whatever, as the Americans say. It was a pre-season game and it did what it said on the bottle.